Minimax is the perfect emulation of famous original from the 70s. Never before has an analog synthesizer been digitally modeled with such precision and perfection. Minimax is unlike anything that has come before. 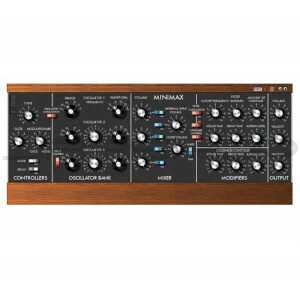 Minimax does not emulate just parts of the synthesizer - Minimax is the instrument. The technically-minded will be impressed by the newly-developed algorithms free of any aliasing, by filter FM, internal feedback capability and oscillator modulation. Others will simply be blown away by the unbelievably fat, direct and powerful sound of the Minimax. Naturally the basic structure of the Minimax corresponds to the original. Three oscillator signals with six selectable waveforms are mixed with noise and an external signal in the mixer section. The legendary 24 dB filter and the amplifier, each with its own envelope generator, follow next in the signal path. As an extension to the original, the Minimax includes an effects section with a Chorus/Flanger and Delay. Of course the effects expand the sonic possibilities enormously, but they can be turned off in order to remain absolutely faithful to the original. The high-precision modeling of the various electronic components is readily apparent in all sections of the synthesizer. The full-range oscillators produce signals with extended highs providing soaring sound with great vitality and energy. We also paid careful attention to the saturation behavior of the mixer section, both for internal and external signals. Saturation gives the sound its typical extremely high ability to penetrate.